For eight years as chairman of the Board of the Trustees, Ed Hajim ’58 exclaimed the classic Star Wars line “May the Force Be with You!” as his final words to graduating classes at each commencement ceremony he attended. On Friday, Oct. 7, alumni, faculty, staff and students came together to honor Chairman Emeritus Hajim and to say “Thanks, Ed” for his many contributions to the University over the years. 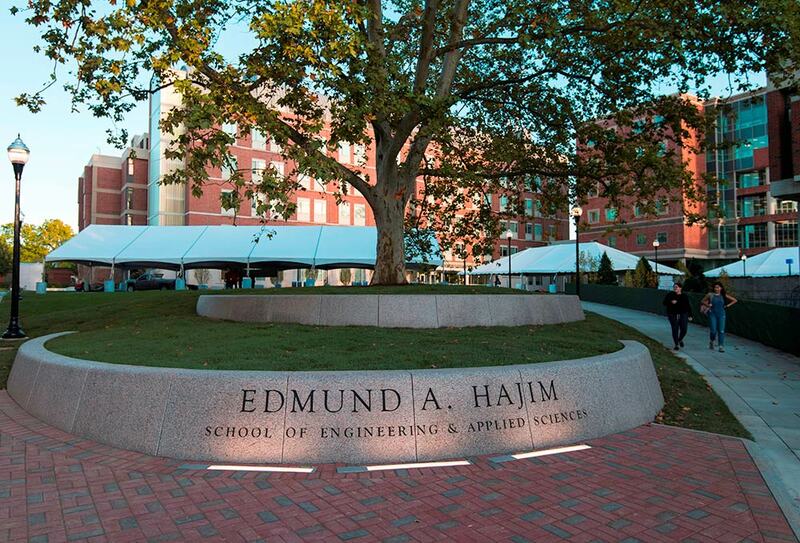 At the event, the Edmund A. Hajim Science & Engineering Quadrangle was officially dedicated, and a new eight-foot statue of Hajim was unveiled. 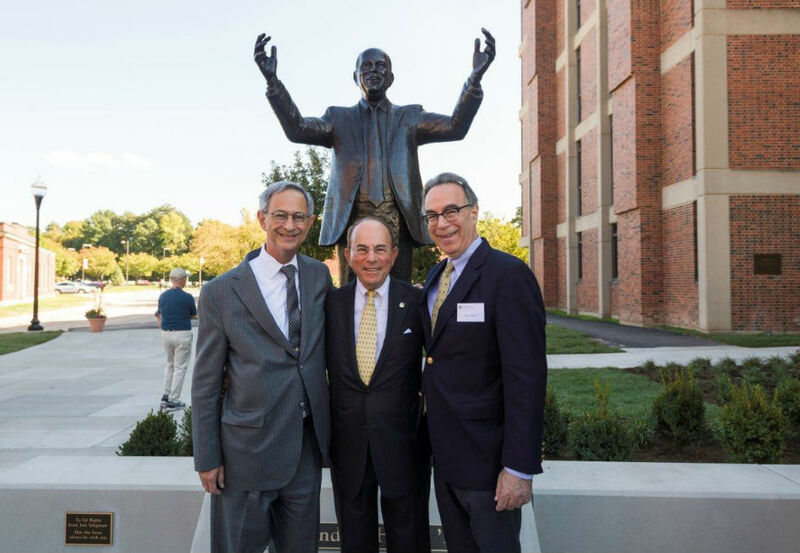 “This event honors my closest partner over the past eight years, Ed Hajim, and his monumental and historic legacy,” said University President and CEO Joel Seligman. “He came here in 1954 on a Naval ROTC scholarship and came to think of this University as his first real home. He is a true embodiment of Meliora. “On behalf of the Board of Trustees of the University of Rochester, it is my honor to officially dedicate the Edmund A. Hajim Science & Engineering Quadrangle today,” said Seligman. The Hajim Quadrangle is an area of campus that was completely redesigned and re-landscaped this past year. This quadrangle surrounded by the Robert B. Goergen Hall for Biomedical Engineering and Optics, Hylan Building, Hutchison Hall, Wilmot Building, the Computer Studies Building and Wegmans Hall has been transformed with new walkways, trees, seating, a botanical rain garden, and new open space for special events. “This is truly an historic day in my life and it is a bit overwhelming,” said Hajim. “This quadrangle is very important for many reasons. The location of all the engineering and applied sciences in one quad should greatly encourage cross fertilization and result in an explosion in multidisciplinary activities. I believe as I always have that this quadrangle will become another true hub of creativity on campus, especially as anchored by Wegmans Hall and data science, whose activities will penetrate every part of the University. “I am honored and humbled,” said Hajim, who was joined at the event by his wife, Barbara, and several of his family members. The new bronze statue of Hajim was created this year by internationally renowned sculptor Marc Mellon, who in 2009 also made the George Eastman statue on the Eastman Quad. Hajim was University Board chairman from 2008 to 2016, and has served the University in many capacities for nearly 60 years, starting as an undergraduate leader and chemical engineering student. A driving force on the Board of Trustees for nearly three decades, he has had a transformative effect. As chairman of the Board’s Investment Committee, he was instrumental in strengthening the University’s endowment, and has been especially involved in strategic planning and advancement efforts. In 2008, Hajim’s $30 million commitment to the University was the largest single gift commitment in the institution’s history and catalyzed the $1.2 billion Meliora Challenge fundraising campaign. In recognition of his generosity, the University named the Edmund A. Hajim School of Engineering & Applied Sciences in his honor in 2009. He and his wife, Barbara, have provided more than 200 scholarships to deserving students here at the University and at other institutions. In 2015, the national Horatio Alger Association of Distinguished Americans recognized him as a renowned leader who grew out of humble beginnings to achieve success and demonstrate a commitment to philanthropy and education. Hajim has been the recipient of numerous University awards, including the Arts, Sciences and Engineering Dean’s Medal in 2013, the Simon Business School’s David T. Kearns Medal of Distinction in 2009, the Hutchison Medal in 2007, and the Garnish Award in 2003. This spring at the 166th Arts, Sciences and Engineering Commencement ceremony, he received the Eastman Medal, in recognition of his outstanding achievement and dedicated service to the University.